The woman we came to know as Adele grabbed the photo. Her loud exclamation in Fang, the local language, provoked a burst of laughter among the gathered villagers. I leaned over to our host, Gaston, for an explanation. He had passed around the photos we brought, and he told us that she wanted to take the picture home. 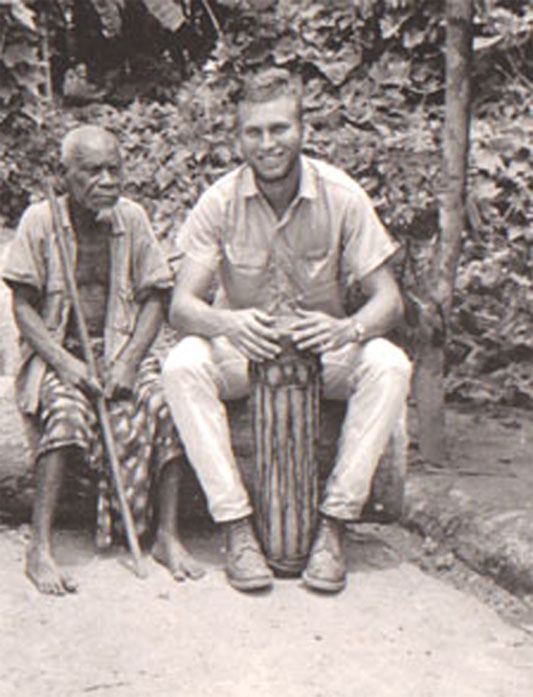 It was a black and white photo of a young Peace Corps volunteer playing an African drum, seated next to a village chief, circa 1964. Those in the open air shelter recognized the young man as Gerard, who had led a team of seven similarly fit, young men in 1964 to the village of Doumandzou to build a primary school. 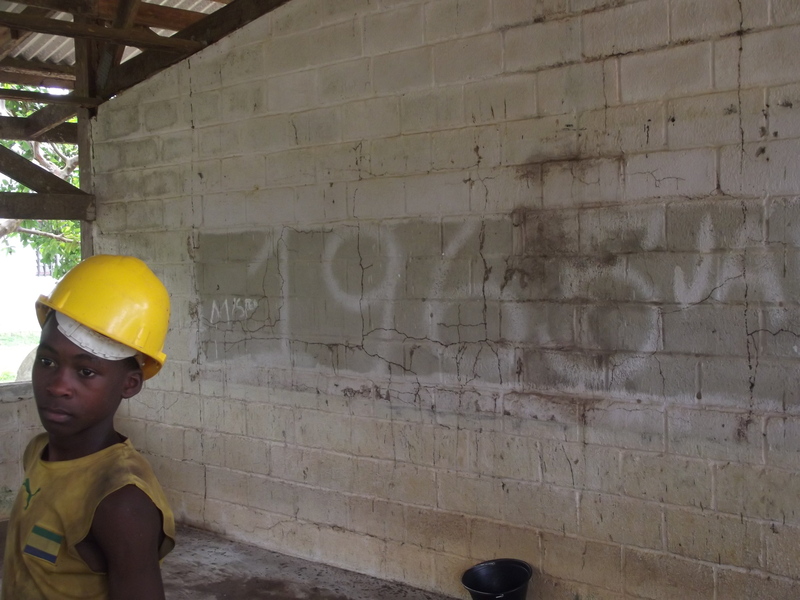 The group of villagers gathered 50 years later to meet us, a small group of volunteers who had come back to Gabon to fix up the school that had fallen into disrepair. We brought with us a handful of photos that Jerry (Gerard in French) Anderson had sent us to see if there were memories and traces of the group of seven who had spent less than a year in the village. To our surprise and delight, there were. Adele had been about ten years old when the group of seven descended on her house, which her father turned over to them for their lodging while they built the school. If there was any doubt to her memory, Adele later rattled off the names of four of the volunteers, matching the list Jerry had sent us – Thomas, Etienne (Steve), Robert and, of course, Gerard. The others in the group were John, James, and Bill. We were in Doumandzou as part of a small project we had dreamed up after a reunion of volunteers who had been in Gabon in the 1970s. We launched a non-profit and called it Encore de la Paix, a play on the French for Peace Corps (Corps de la Paix.) With a fiscal sponsor taking care of tax deductions for us, we started fund-raising for the materials to fix up the school. All told, we raised about $20,000 from friends and family members and Citibank Gabon. Paying our own way over, we descended on Doumandzou in January 2015. Fifty years after they were built, the school and the two teachers houses were indeed in dire need of repairs. The laterite foundations and cement block walls still stood, but much of the wood for the doors and windows had fallen victim to the weather and insects. The tin roofs had come off most of the teachers’ houses, exposing the interior to rain and wind. Few of the vertical wooden planks remained in the school windows, replaced by temporary boards and tin to keep the village goats from hopping into the classroom at night for shelter. Nothing similar was done on the houses that had been vacant for years, so goats had taken over that space, as evidenced by the layers of their excrement on some of the floors. The forest was rapidly moving to take over the houses, with vines and trees running through them, along with carpet-like moss on the floors. Fifty years is a long time, and while the school showed signs of age, the memories of the villagers for the seven volunteers remained fresh. Besides Adele, a jovial elderly man named Essame Obame Pascal, introduced himself as the mason for the original construction. Even people who had no first-hand recollection of the seven knew that the spring on the north side of village had been discovered by Robert, one of the original group. The spring still runs today, and its clear, clean water provides cooking and drinking water to those willing to make the short walk down a steep hill, and back up again balancing a heavy bucket on their heads. Gaston, who was a young boy when the school was built, is trying to pump the water up from the spring to a cistern where it can meet village needs more readily. Working on the school, we felt at times like archaeologists, and, as we scraped, tore away, demolished and pushed back nature, the stories of the earlier volunteers came through in the construction itself. One day, while in one of the classrooms making the cement bricks for the new windows, I looked up at the wall, and noticed large figures behind where the blackboard had stood. We had taken down the blackboard a few days earlier and had been walking around the classroom, sweeping and cleaning it out, but had not focused on the painted message. I saw a number, and then a few more, and then put them together, realizing it was the year “1965.” Next to it were the initials “JA” which we knew right away were Jerry Anderson. There were two more initials, a “P” and either a “C” or a “D.” Since PD made no sense to us, we concluded it was PC, for Peace Corps. Not hieroglyphics or traditional symbols, but still a message to us from 50 years prior. On another day, a bulldozer owned by the Chinese logging company in the next village, came through, and offered to clear away the encroaching brush of the forest around the school and the teachers’ houses. As the dozer pushed the forest back 50 yards or so, a tin fence appeared; then we noticed that the fence had a roof. We thought it was a shed, but Adele told us that it had been built by the earlier volunteers for the teachers’ houses. Upon investigation, we saw it was an outdoor latrine, still serviceable and relatively clean. With further clearing by villagers to push back some of the garbage strewn about near the school amidst the growth of plants, bushes and trees, yet another latrine was uncovered, this one built for the use of students at the school. Inside was an old, wooden brick mold, used by the 60s volunteers to make their cinder blocks. To those of us who served as volunteers, Peace Corps was more than just a job, or a development project. It was about a connection to the people in the communities where we served. Halfway through the project, I received an e-mail from Jerry Anderson, who was as surprised as we were that the villagers remembered so much. Most Peace Corps volunteers readily acknowledge how important the experience was to us, how it reshaped our lives. It was always harder, though, to assess the impact of our presence on the communities where we lived and worked for two years. 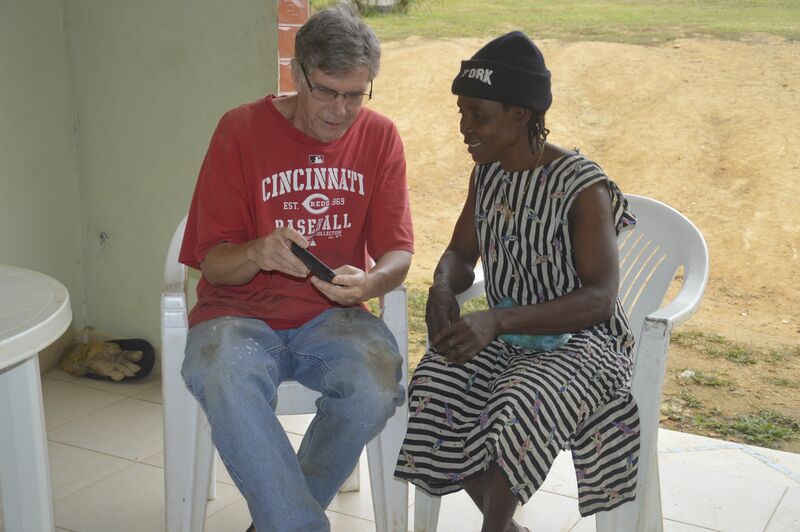 Those in the village remembered Jerry and his group; they attributed the school, the houses, the latrines and the fresh water spring to them, but also remembered them as real people, as friends. These schools in Gabon stand out. More than for their slightly different design, they stand out for the memories attached to the buildings, for the short periods of intense contact, visible reminders that Americans lived and worked side-by-side by Gabonese in their remote villages. The schools are the visible reminders of a moment when the U.S. once reached out to the world with the optimism and energy of a President who realized a vision to engage and learn about the farthest corners of the world. In those places, far from the view of aid agencies and embassies and politicians, these buildings also testify to the open-armed hospitality of the hosts, who, by welcoming these strangers, tolerating our errors, and teaching us, made us all realize our common humanity. These are buildings — and ideals — worth preserving and renewing.